New shopaholic friends are coming to toy store shelves near you just in time for spring! I'm thinking of Easter basket gifts, my friends! Ready, set, unbox with the Boxy Girls! Boxy Girls are dolls that love shopping and unboxing their online orders. Super cool and super collectable! Each Boxy Girl comes with her very own boxed fashion surprises: shoes, bags, makeup, jewellery and clothes! You can even get extra surprise packages with extra items your little one can stage their own unboxings with Boxy Girls! Boxy Girl Series 1 is available now with 4 fashionistas to collect: Riley, Nomi, Brooklyn and Willa. Check out the official commercial! Everyone loves a surprise, especially when you get to open it with a friend. These dolls (and accessories) will make a cute addition to any doll collectors showcase shelf! 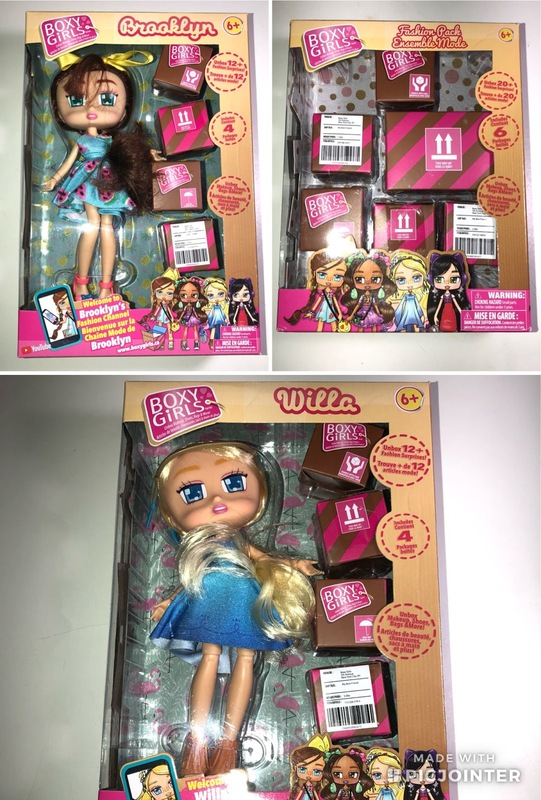 You will be able to find Boxy Girls and Fashion packs at Walmart and Toys R Us for $24.99 a set! Follow @RedPlanetGroup on Instagram and like the Red Planet Group Facebook page for more information about these and other fun toys! We received complimentary dolls in exchange for this feature. Opinions and comments on this blog are those of the author.